I just love when the weather starts turning colder. That means that I can drag out my collection of scarves and really accessorize my outfits. I love scarves and have so many – everything from warm wool scarves to lightweight infinity scarves. And the sad part is that I am always looking for new scarves to add to my collection! If you love scarves, too and you want to add a few to your winter wardrobe this year – without spending a fortune in department stores – I’ve got just the collection for you. 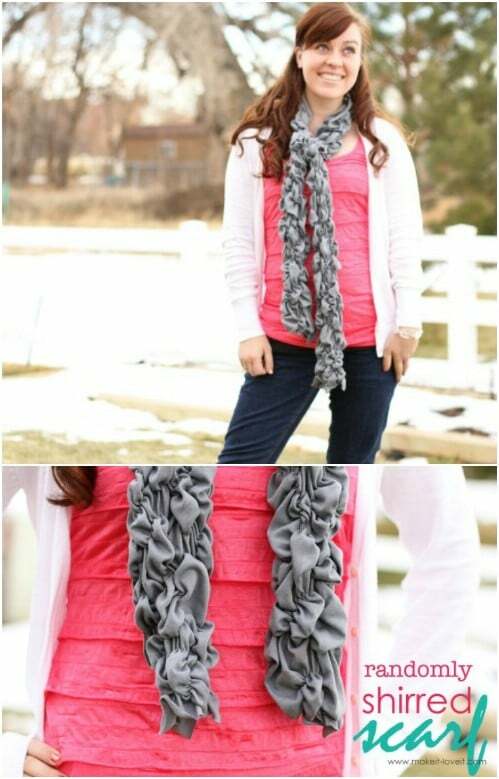 I have found 20 of the easiest DIY scarves that you can make to add to your wardrobe. These scarves range from sewn to no sewing required to crochet and even knitted. 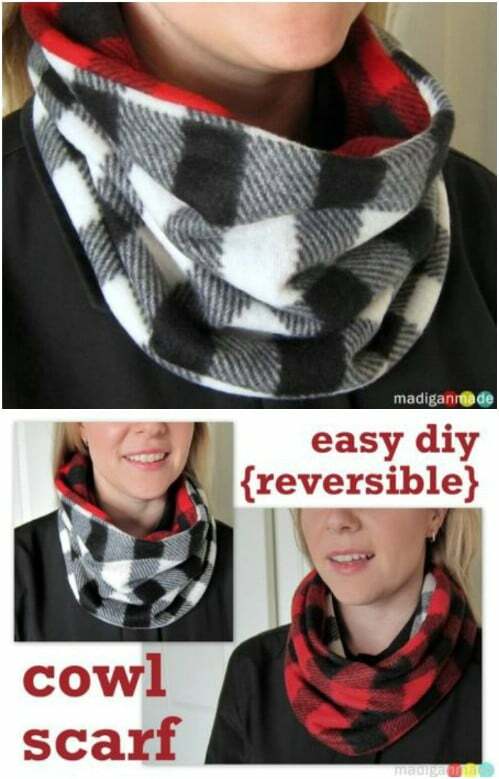 Whatever you prefer to do to make your own stylish accessories, there is a DIY scarf in here that you will love. If you’re new to knitting and crocheting, you can also check out these 100 crochet patterns that are perfect for beginners. You’ll find loads of things that you can crochet that will go beautifully with your new scarves. And even if you have never held a crochet hook or knitting needles, these scarves are so easy to make that you’re sure to have one finished before cold weather arrives. You’ll also find a lot of repurposed scarves in this collection. 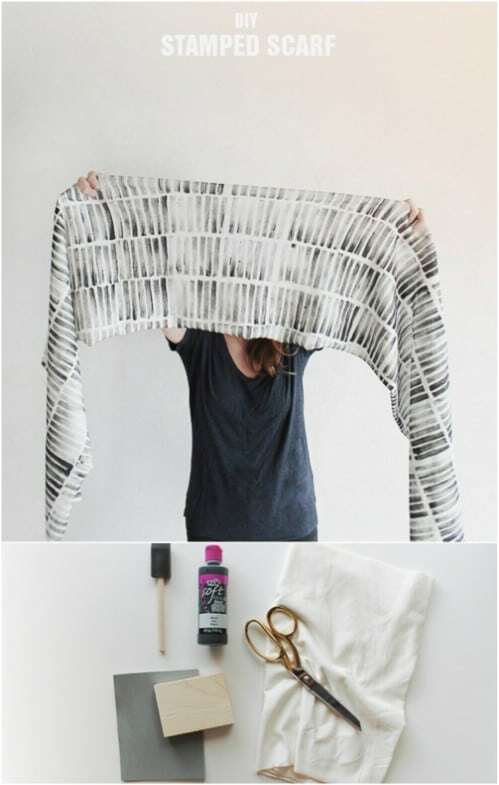 Turn an old t-shirt into a lovely scarf or even an old jersey. There are so many ways that you can add lovely scarves to your winter wardrobe, and I’ve found the easiest of all of the DIY scarves. These also make wonderful gifts for the holidays or birthdays and you have plenty of time to complete some of these before gift giving season is here. There is even one that you can finish in about 10 minutes! 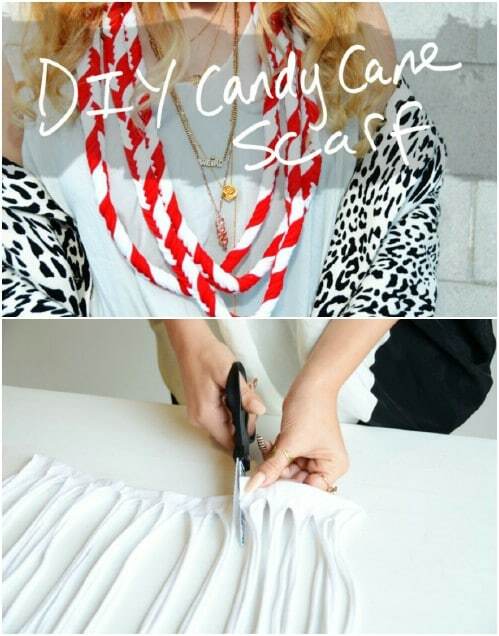 Hold onto your hat and let’s get started making some great DIY scarves. And, you should also check out this great DIY upcycled t-shirt rug. 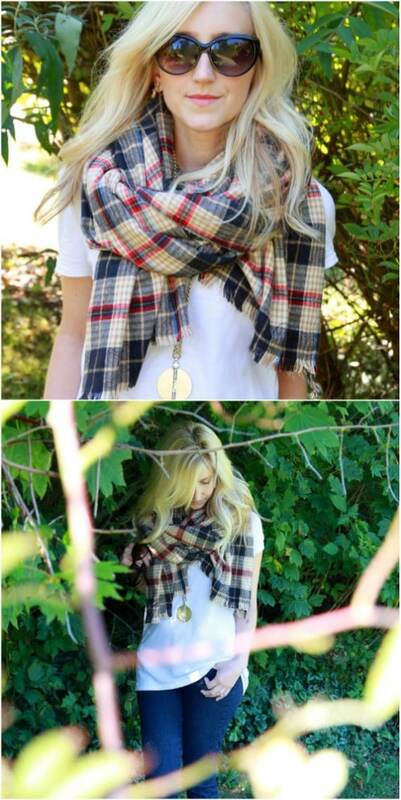 Blanket scarves are very popular and they make wonderful gifts – for yourself or someone else. This one is a no sew project and it is really easy. If you have the right amount of material, you won’t even need to cut this one. It’s just material that has been frayed and it makes the most gorgeous blanket scarf. 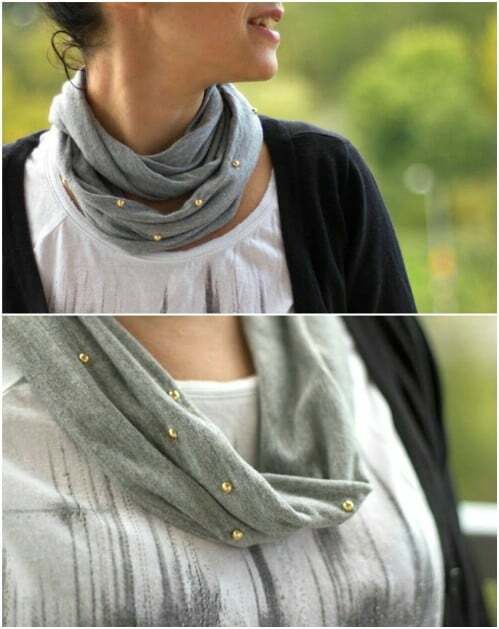 Here is another beautiful scarf that you can make without sewing the first stitch. This one is stamped so it has a gorgeous design – and you determine the design. This one is made from a really comfortable jersey knit fabric and you make the stamps yourself. If you have never made your own stamps, you are in for a real treat. Once you’re finished with your scarf, you can use your homemade stamps to create so many beautiful things! 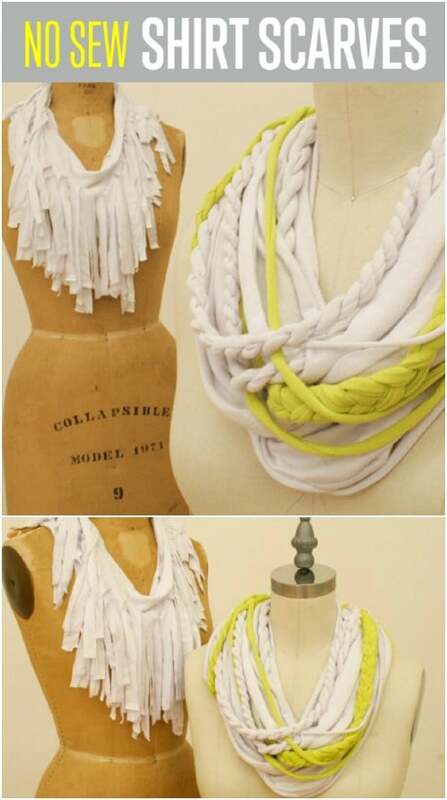 An old t-shirt is all you need to make this fashionable braided scarf. This one is so super easy and you can have it finished in just a couple of hours. This one doesn’t require any sewing. You just cut and braid – you could do this with all of your old t-shirts and give them away as gifts. I love DIY projects that let me repurpose old clothing. You could even make a repurposed t-shirt peplum top to match your new scarf. 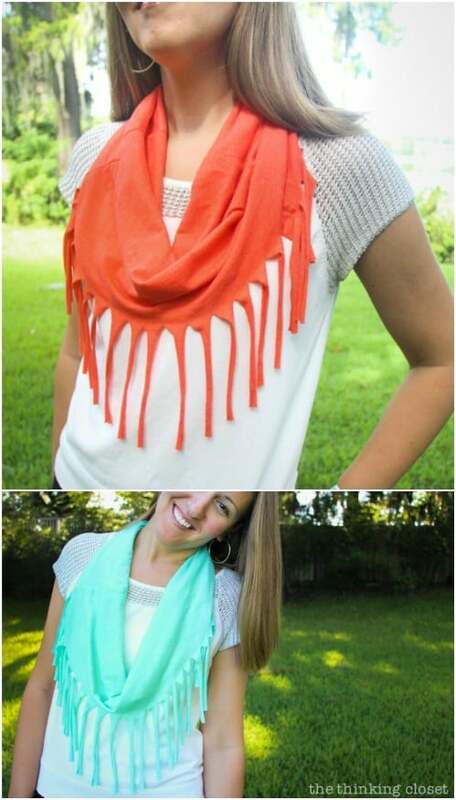 This is another beautiful scarf that you can make from an old t-shirt. This one is a really festive red and white and it looks like a candy cane. It’s a bit thinner than most other scarves but it is super fashionable. It would also make a wonderful holiday gift for teens or you could do this one in different colors and make it perfect for summer fashion – it’s really lightweight and perfectly matches just about any outfit. This chunky scarf can be easily crocheted, even if you’re just beginning in this craft. It has a gorgeous look to it and it’s so big and bulky that it is perfect for keeping you warm this winter. This is also a great one to give as a gift. The pattern is super easy to follow and you don’t need to know any complicated stitching to finish this one. You will however, need some bulky yarn and a large crochet hook. With all the talk about nursing in public of late, this convertible nursing cover scarf will come in really handy. This would make a wonderful gift for a baby shower if you know that the new mother is going to be nursing. It’s also a really simple scarf to make and converts from a large cover to a really fashionable infinity scarf in a matter of minutes. If you have a knitting loom, you can literally turn this scarf out in just an hour or so. Knitting looms are great for knitting something quickly, particularly if you want to knit but have never learned how to use needles. They’re also great for those with arthritis and other conditions that keep them from handling those smaller needles. This gorgeous scarf is made on a knitting loom and it makes a wonderful gift. This is another scarf that you can make without sewing a stitch and it’s got a wonderful contrasting color scheme. You make this one with fleece, which is super warm and perfect for a winter scarf. At the bottoms, you have a contrasting color that creates the fringe. It looks much more complicated than it is to make and this is one that would be perfect for giving to teens or pre-teens for the holidays. You have to love those no sew DIY projects. I just love this scarf that you can make out of an old t-shirt. It has gold studs – although you could use silver if you prefer and if you don’t have an old t-shirt that you want to cut up, you can buy the same material at any fabric store and it’s not at all expensive. The hardest part of this one is connecting the studs, and even that part is really simple. 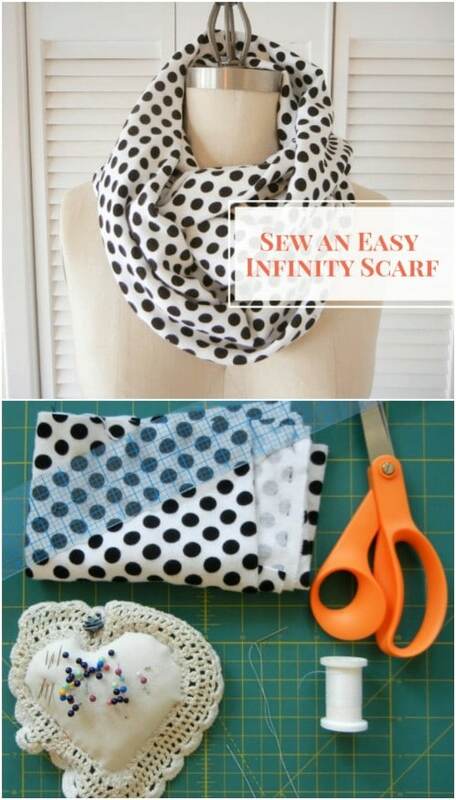 You can use a sewing machine on this gorgeous infinity scarf but you don’t need to. This one can be just as easily sewn by hand and it takes very little time to make it. 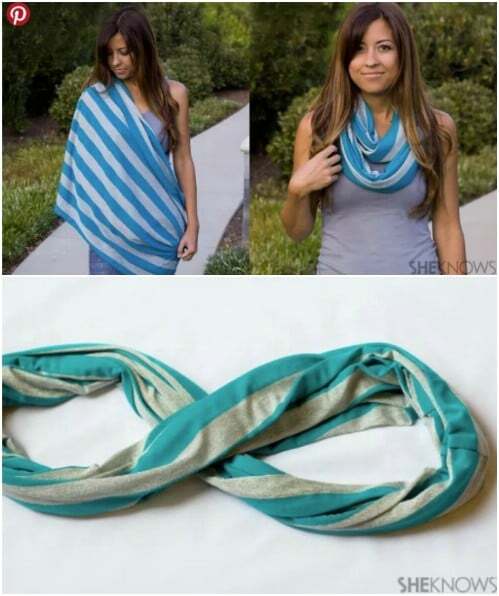 These are such wonderful gift ideas – make an infinity scarf for all of the ladies on your gift list this holiday season or make several for yourself to wear with different outfits. material together. The fringe gives it such a lovely look and this one is so easy that you could have one in every color – and not spend more than a day making all of them. 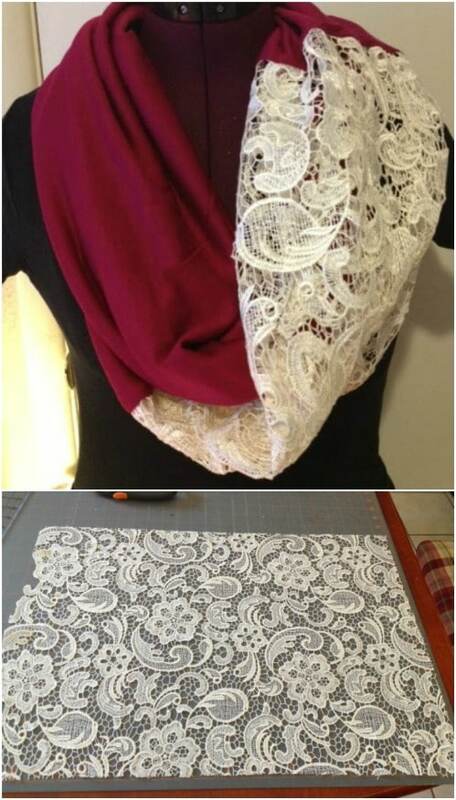 If you need a really elegant scarf for yourself or to give as a gift, this lace infinity scarf is it. This one is so easy to make and it is gorgeous when it is finished. There is a bit of sewing required for this one, to join the lace to your material of choice but it’s not at all difficult. Even if you are new to using a sewing machine, you can have this one finished in an afternoon and still have time for a relaxing cup of coffee. 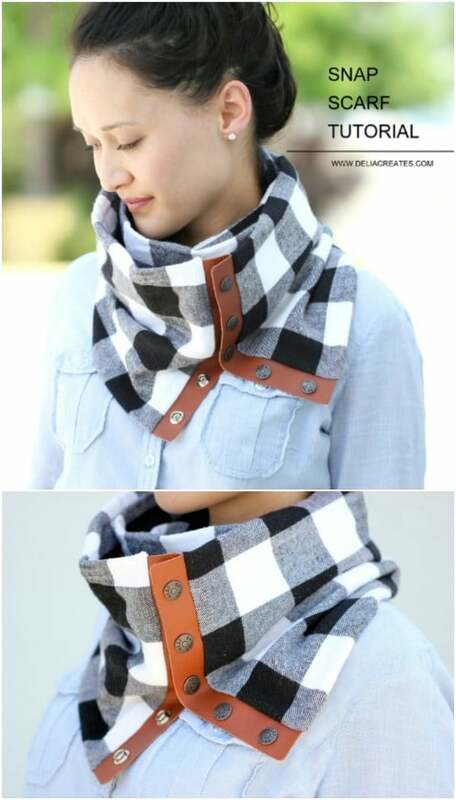 This leather and flannel scarf easily rivals anything that you will find in a high end department store and you can make it for really cheap. It’s also pretty simple to do and makes such a lovely fashion statement. The leather edges snap together with rivets and the flannel really helps to keep your neck warm during those cold winter months. This gives you a great way to repurpose old flannel shirts. 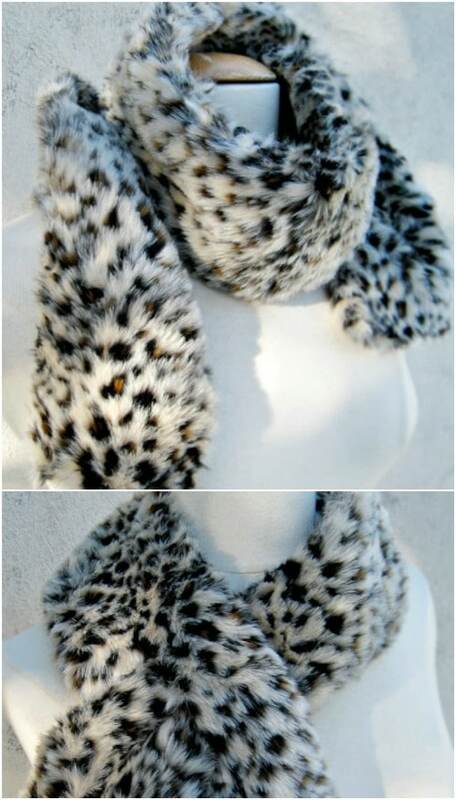 You can honestly use any faux fur design to make this scarf – white would be really lovely. The scarf is really easy to make and is perfect for those cold winter evenings, especially when you want something a bit dressier than a typical knit or flannel scarf. You sew this one together by hand so you don’t even need to get out the sewing machine. It’s really simple and comes together really quickly. You don’t need to know how to knit or crochet to create this adorable yarn scarf. You do need a large skein of yarn and some leather to make the design. 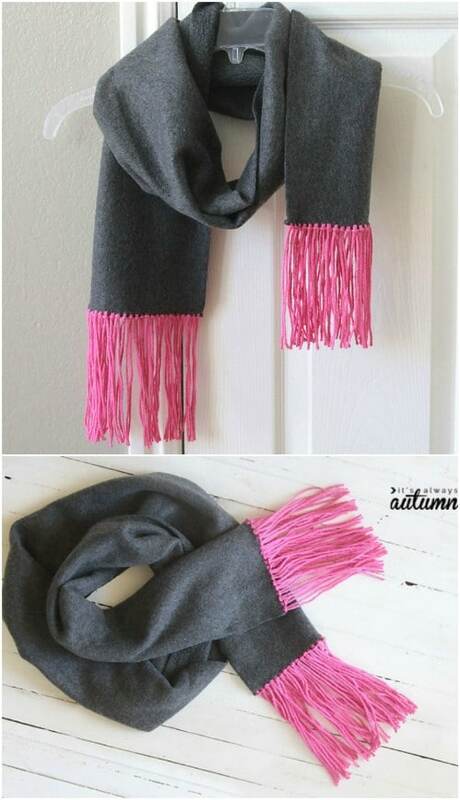 This is a lovely scarf and it is so easy to make. If you have always wanted to give someone a gift that you’ve made out of yarn and you don’t know how to knit or crochet, you are definitely going to want to take a look at this one. This reversible cowl scarf will certainly keep your neck warm this winter and it is very stylish, too. This one does require a bit of sewing, but nothing too complicated. You make it with two different designs so you can reverse it to match your current outfit. You just need two colors or designs of fleece for this one, and your sewing machine. It comes together pretty quickly and makes a wonderful gift. This scarf is great for those fashionable outfits when you need something that is not quite a necklace. I love the look of this one and it is much easier to make than you may think. Don’t let those shirrs scare you – it’s really not at all difficult. This one just has random shirring spots, which give it a beautiful design and it makes a great gift for teens or women of all ages. I really love tie dye projects – they give your clothing such a gorgeous look and the style is really reminiscent of the 1970s. 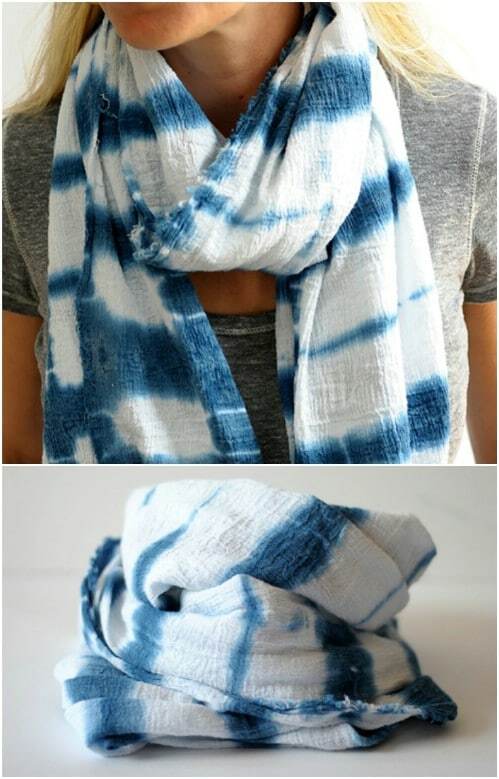 This indigo tie dye scarf is really easy to make and it doesn’t require any sewing unless you just really want to hem the bottoms. Personally, I love the fringed look so I wouldn’t sew it. This is a great lightweight scarf that is perfect for warmer days and it makes a wonderful gift for anyone you know who adores scarf fashion. You have surely seen those blankets that you can knit with your hands, right? 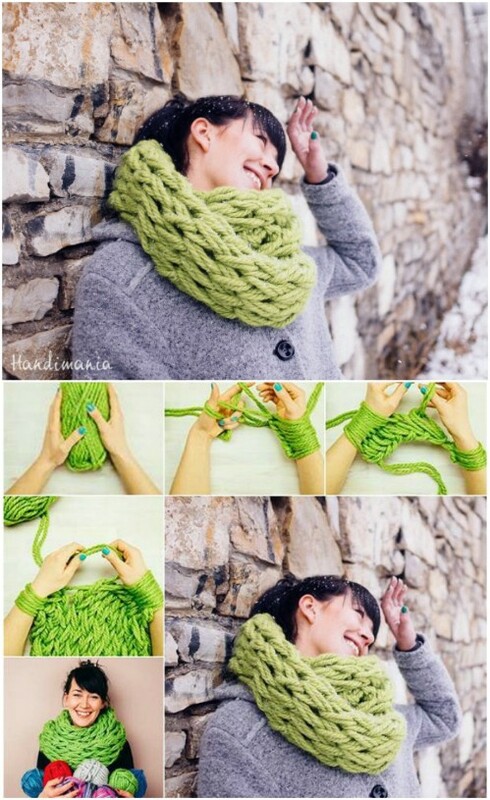 Did you know that you can also knit a scarf with your hands? 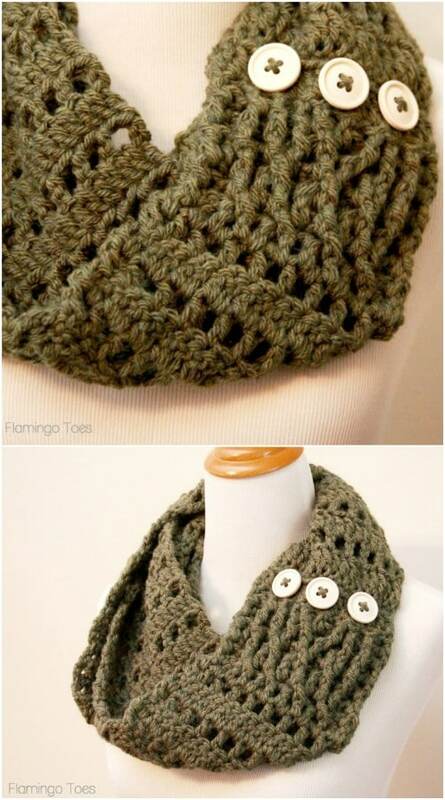 This one is really easy and makes a beautiful chunky scarf that is perfect for winter. You don’t even need to know how to knit and you don’t need any knitting needles. You can have this one finished in just a couple of hours and you are going to love how it looks when you’re done.